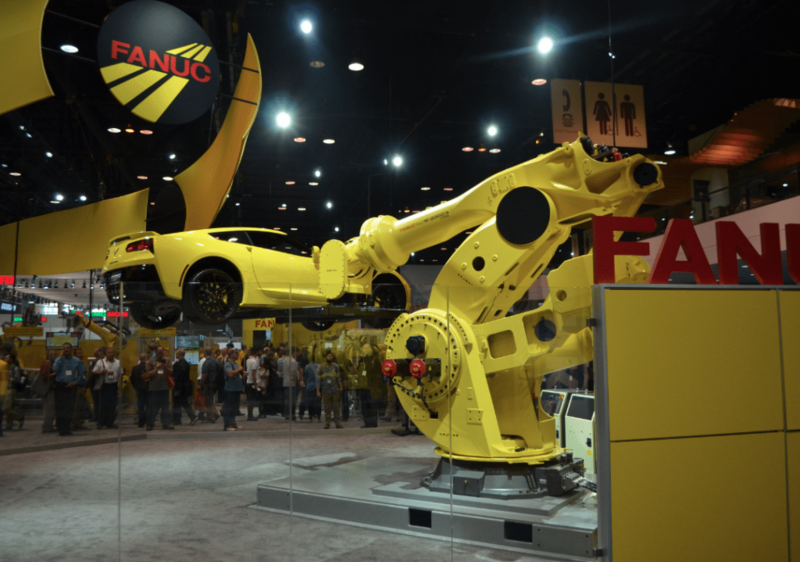 Chicago’s International Manufacturing Technology Show (IMTS) is over until 2018. During the course of 6 days 115,612 visitors traversed over 1.3 million sq. ft. of exhibition space, taking in demonstrations and displays from over 2,000 exhibitors. 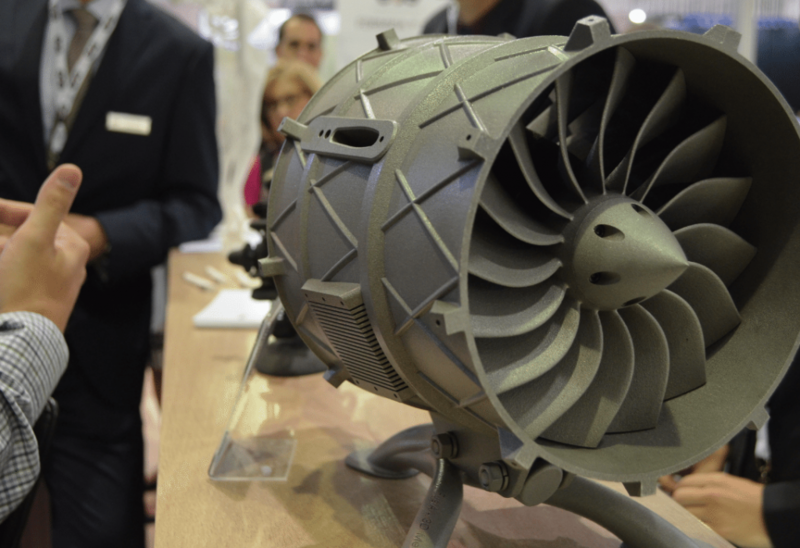 3D printing was not only a major presence at the show, but also it was the technology on the lips of some of the most distinguished visitors. 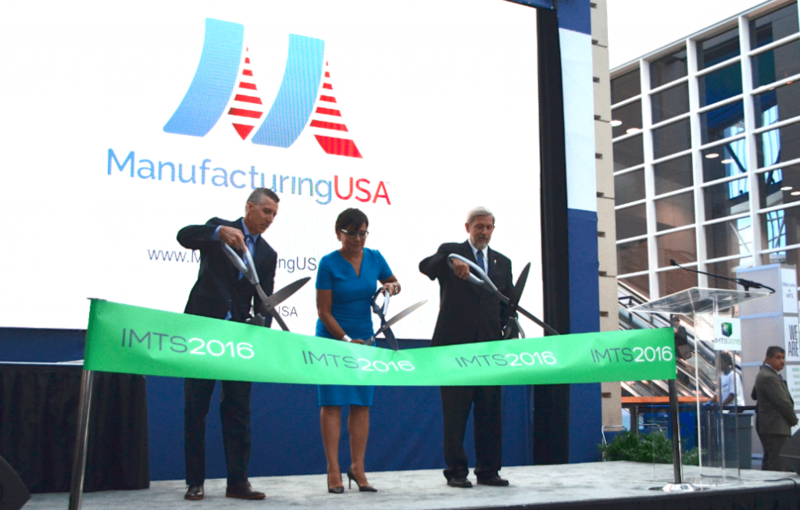 “From Ford to 3D printing, we are a country who makes,” said the U.S. Secretary of Commerce Penny Pritzker during the opening of IMTS on Monday. 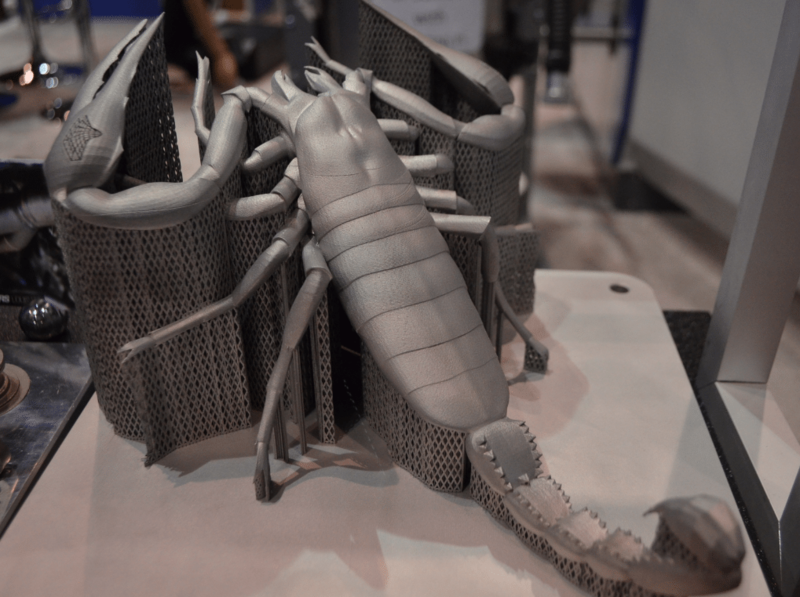 Show organizer and AMT VP, Peter Eelman said, “I think this will be the show that people will remember for additive going mainstream.” This year there were over 50 companies involved with 3D printing in some capacity, ranging from 3D printers, 3D scanning, software, materials and hybrid manufacturing. 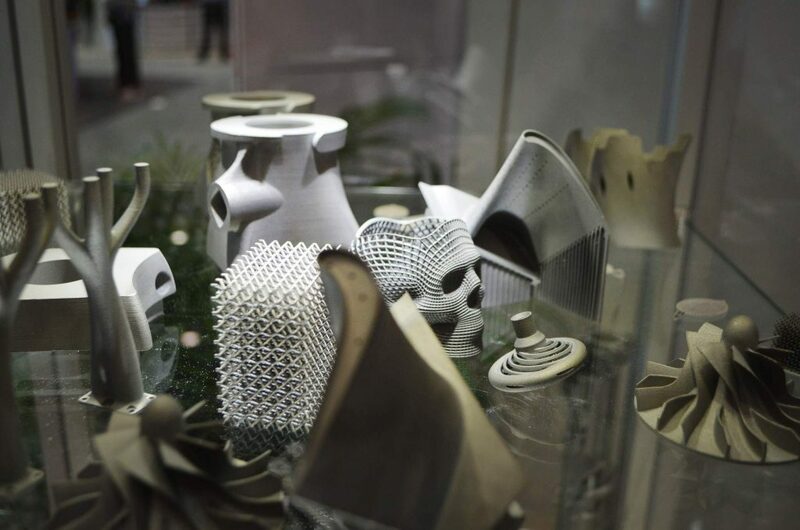 2016 was also the first time 3D printing had its own separate wing for companies primarily focused on additive manufacturing. 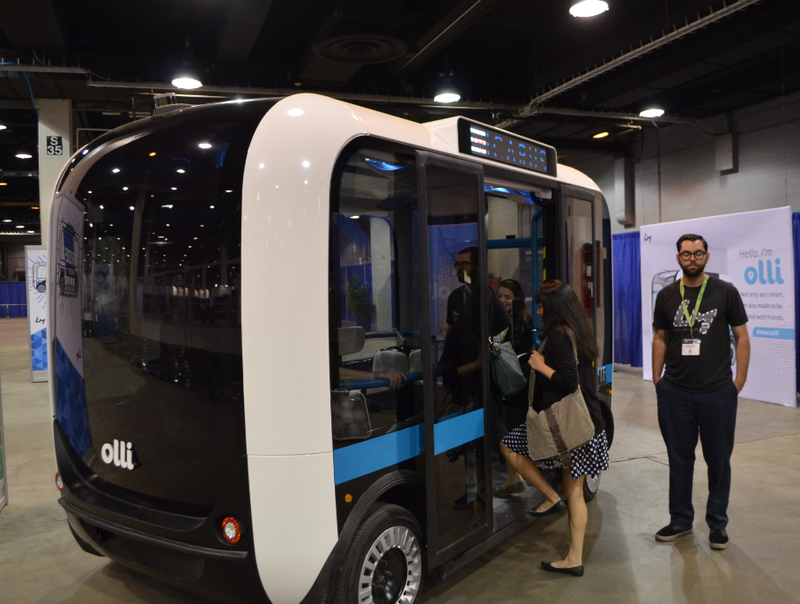 EOS was among the big names in 3D printing who hosted events at IMTS. CEO Dr. Hans J. Langer rounded off an afternoon of presentations by the company on Wednesday. 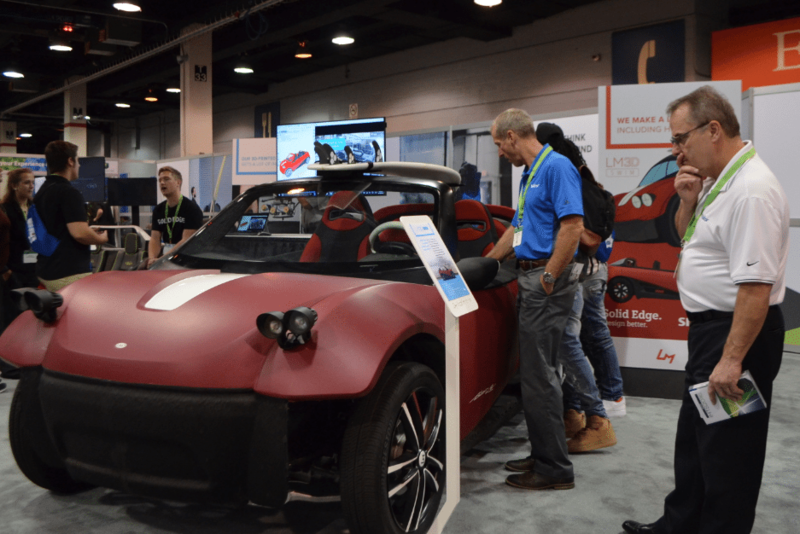 The overarching theme of the EOS North American User Day (NAUD) was how additive manufacturing can be integrated into industry. 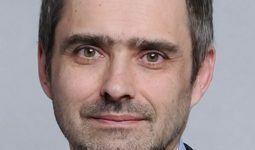 Speakers included EOS executives such as Dr. Adrian Keppler and Dr. Stefan Fries. 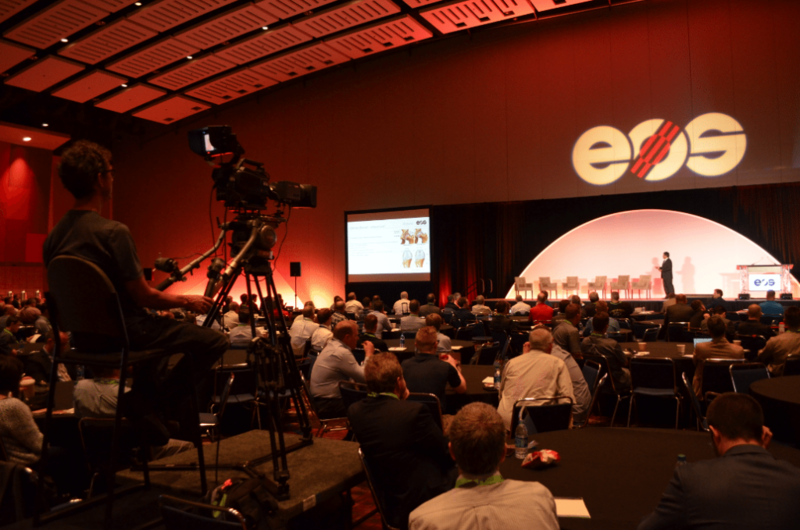 Glynn Fletcher, President of EOS of North America Inc., expects additive, “to be 25% of the show” within the next five years. 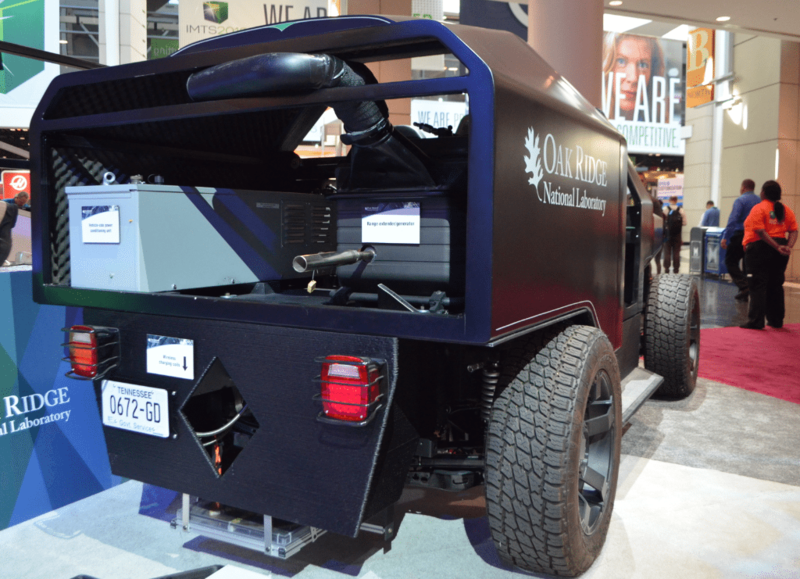 With almost 30 years in the machine tool industry Fletcher has the experience to backup this bold statement. 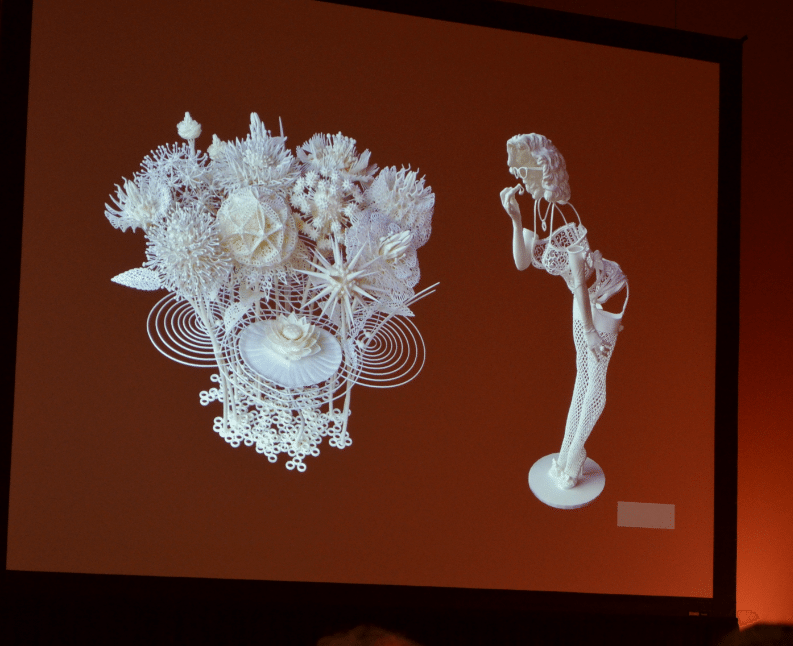 EOS also invited artist Joshua Harker to present the design process for his work. Harker’s work was on display at the EOS booth and guests at their rooftop-networking event received a specially commissioned piece to take home. 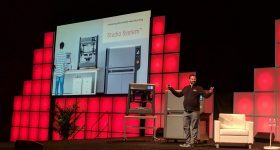 As previously reported, 3D Systems hosted an event with updates on strategy, the announcement of their 3DXpert software and a new iteration of the modular Figure 4 manufacturing process. 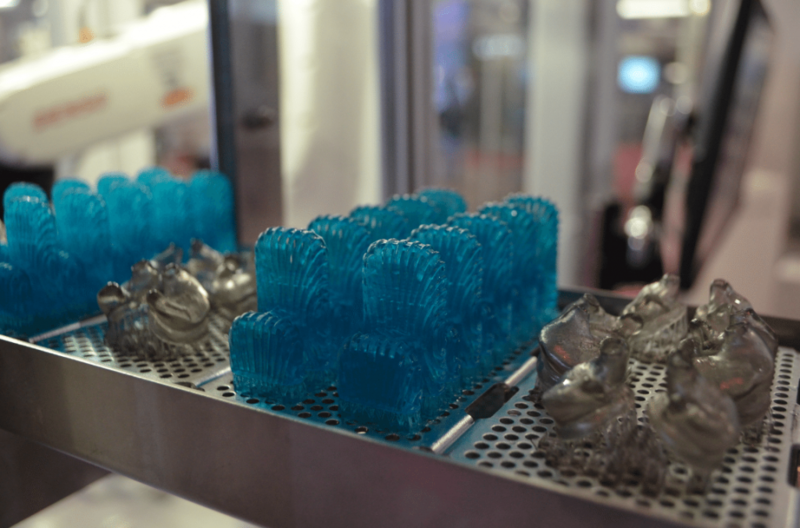 Figure 4 was on display at the 3D Systems booth and also the Methods Machine Tools area. 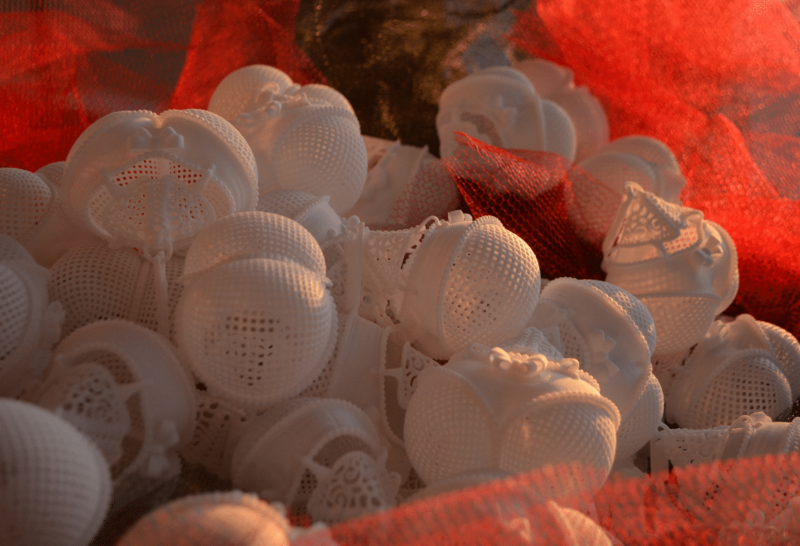 3D Systems Figure 4 3D printed parts. 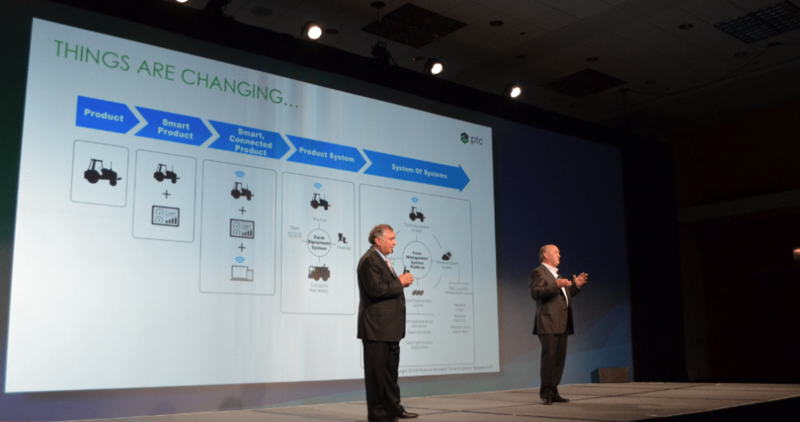 During 3D Systems’ presentation on Monday CEO VJ was joined by seemingly endless number of guests including the CEO of PTC, Jim Heppelmann who said 3D printing means companies are approaching product design and manufacture in a new way that is a, “reset on what is a product.” PTC of course invented parametric CAD during the mid-80s and was the company where Leonid Raiz, who developed .stl, was employed at the time. Heppelmann elaborated on the relationship between 3D printing and Industry 4.0, aka Smart Factories, and how a “digital twin” of physical product can be created to facilitate product development and “accumulate the product history and experiences of that part in the field.” This allows simulations to be run that mimic what might happen to a product and to inform service procedures and design improvements. 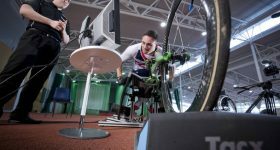 Combining 3D printing, IoT, Augmented Reality, Predictive Analytics and Industry 4.0 was the subject of a PTC video that showed data on vectors and forces overlaid in real-time on a bicycle in motion. 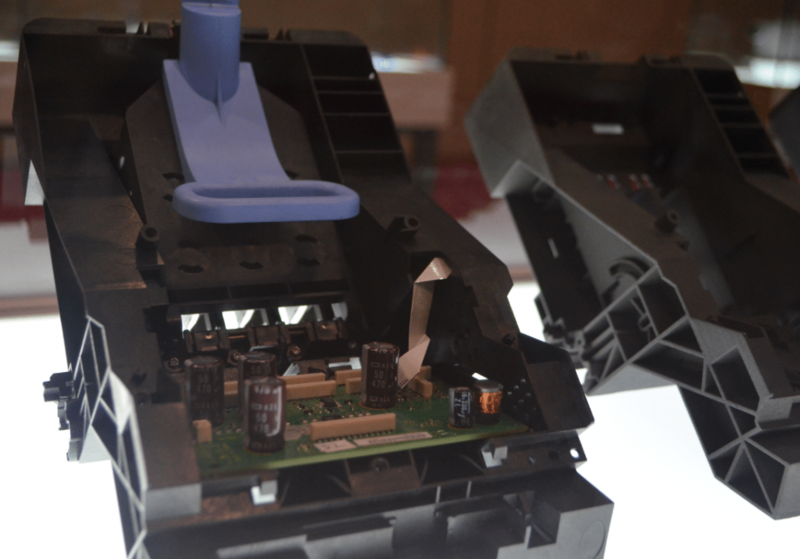 Another big name, HP, hosted an inaugural event: the Voxel Vision dinner. 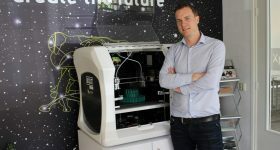 A small group of journalists were invited to learn more about the companies Multi Jet Fusion 3D printer ahead of its commercial release later this year. The evening event included a short talk by Chris Connery, VP for Global Analysis at CONTEXT, a market research company. 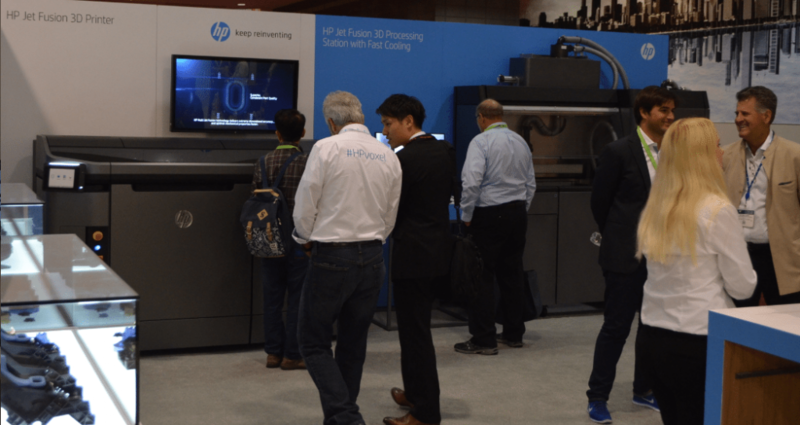 HP representatives Scott Schiller, Lee Dockstader, Tim Heller and Michele Guthrie were on hand to answer questions and demonstrate some of the forthcoming innovations. 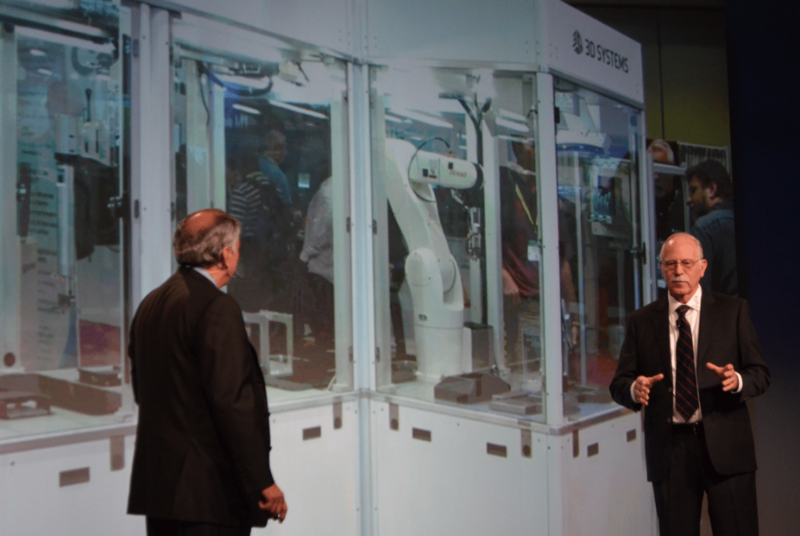 This included a real-time demo of HP’s integration of software and hardware. 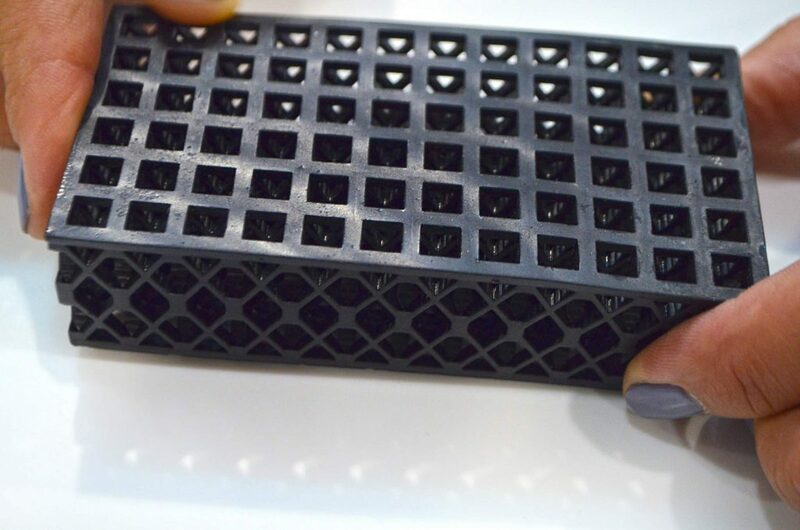 Using the camera in his cell phone, Schiller showed me how a 3D printed gear could be identified and scheduled for printing. 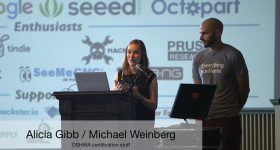 The technology uses an algorithm to identify the part and match it to a database. The gear was also printed with a pink outer layer around its teeth, this allows a quick visual check of wear and tear to be made as the color is eroded by use. 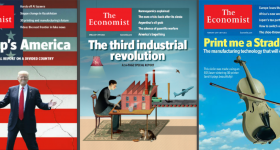 DeSimone echoed a sentiment expressed by many others, that 3D printing in the mind of the wider public is now much better understood than in the past. 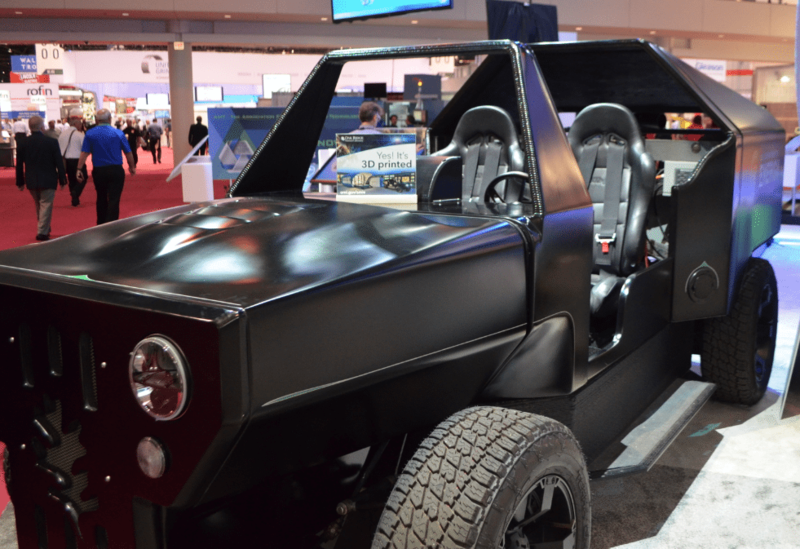 “One of the things that has been a blessing for us is that we’ve come in after 3D Systems and Stratasys who have laid down 20 years of prepping these folks.” IMTS attendees asked Carbon about the possibilities for electrical connectors, compressors for high efficiency air-conditioning units and other applications. 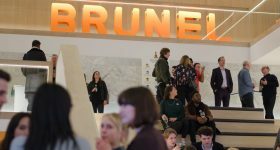 Away from the expo, a multitude of conferences took place. 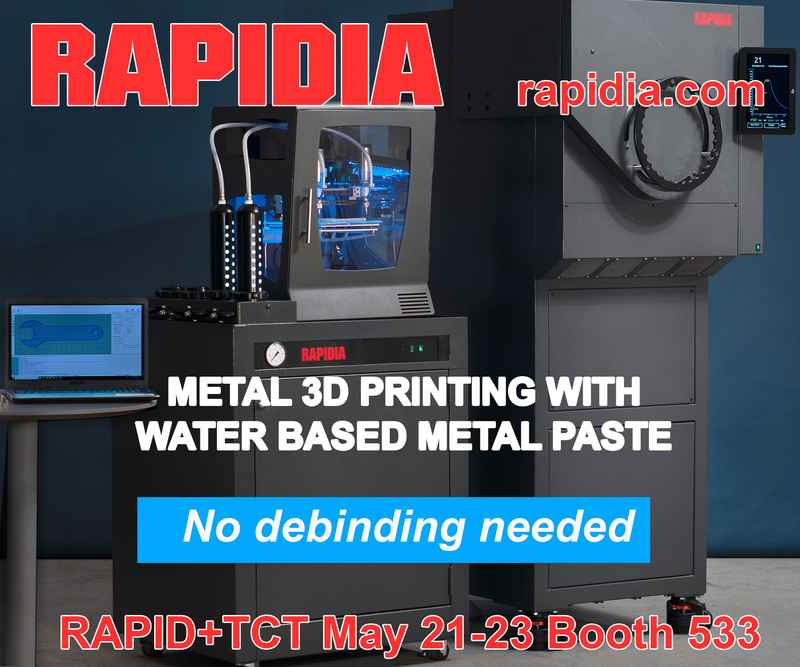 Of particular interest to 3D Printing Industry readers was the Additive Manufacturing Conference on Tuesday and Wednesday. 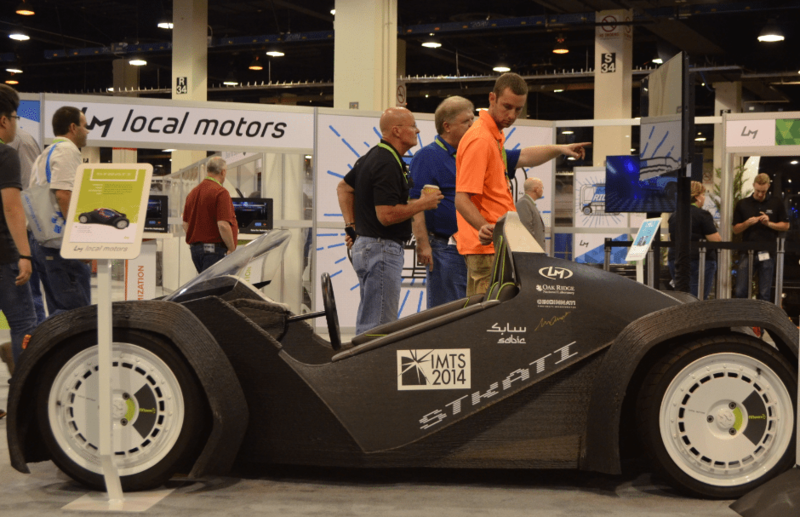 The program included talks from Autodesk, Baker Aerospace and Proto Labs. 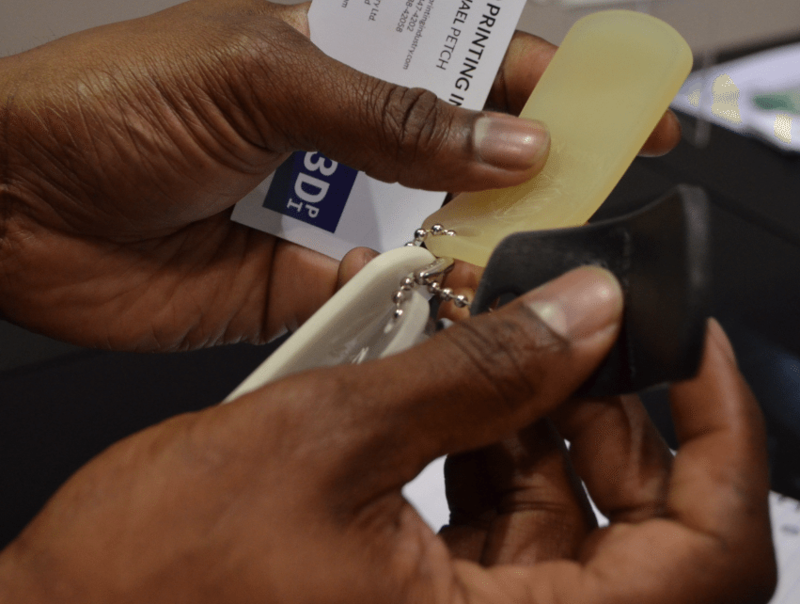 In the adjoining networking room, 23 companies involved with 3D printing had set up booths where attendees could learn more. 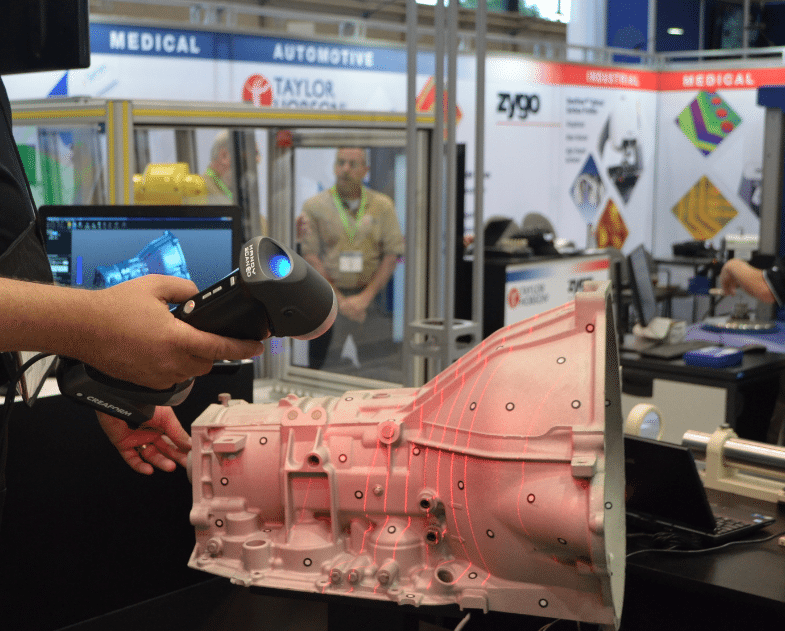 One such company was Fabrisonic and CEO Mark Norfolk brought one of the more novel technologies to IMTS this year, Ultrasonic Additive Manufacturing (UAM). 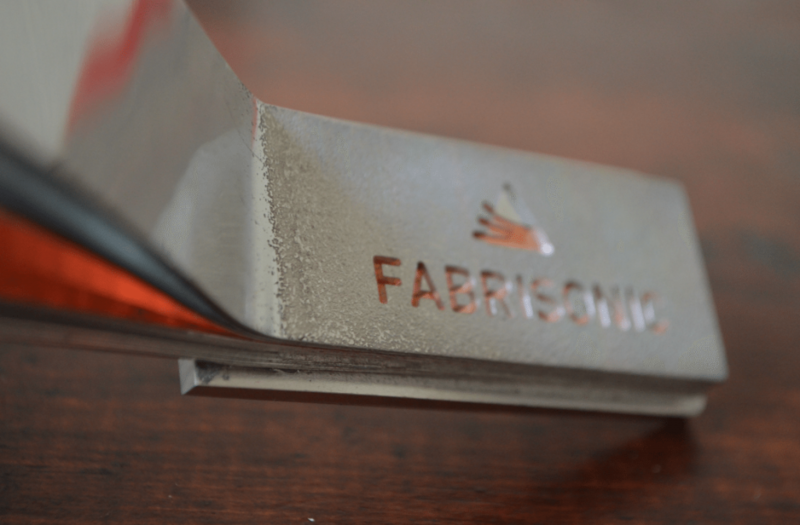 Using sound waves at 20,000 Hz, Fabrisonic are able to weld dissimilar metals at much lower temperatures than traditional methods. 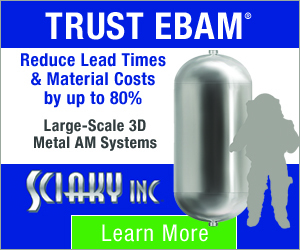 This means embedding RFID sensors or electronics becomes more feasible. 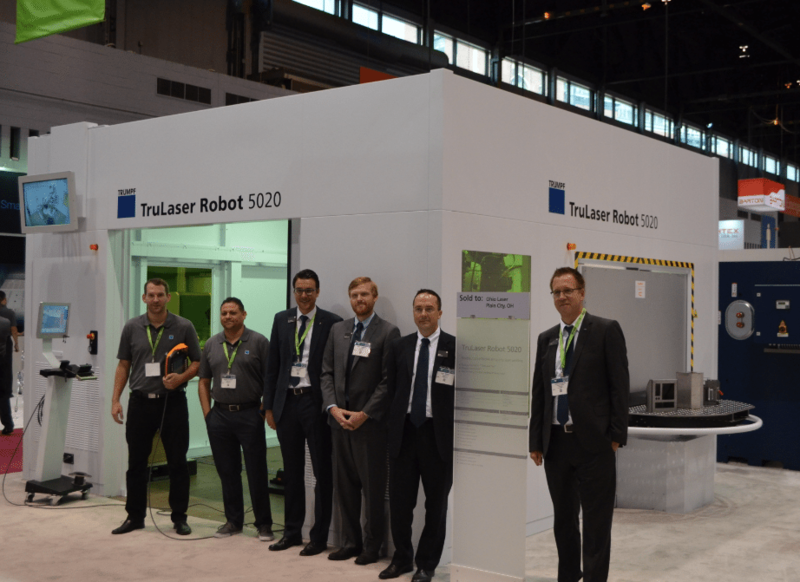 The Laser Institute of America (LIA) hosted their inaugural Industrial Laser Conference at IMTS this year. 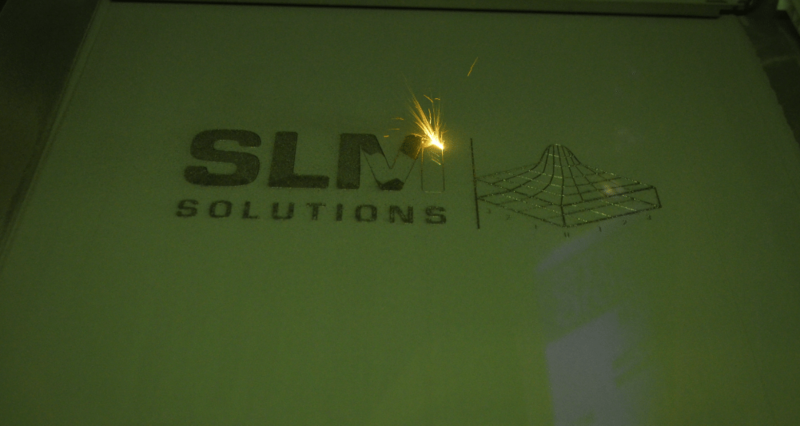 A decrease in the price of lasers and an increase in power and pulse rate are seen as key drivers in the expansion of industrial 3D printing. 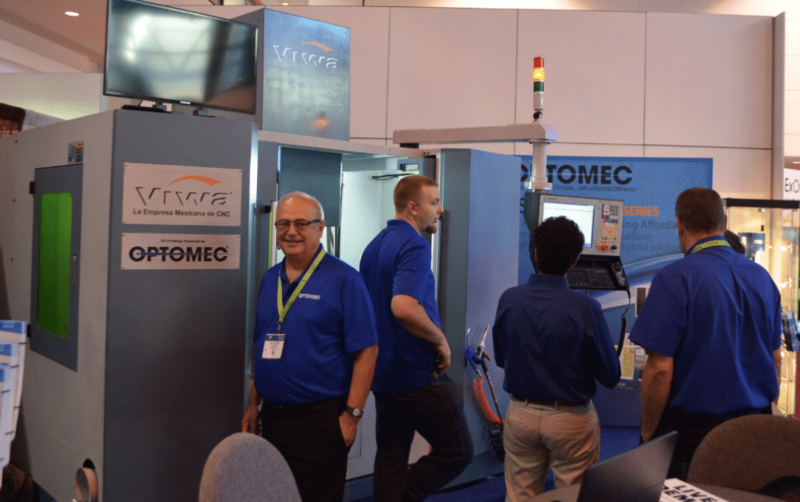 Among the speaker program were Jim Cann of Optomec, Fraunhofer’s Rahul Patwa and Frank Geyer of Trumpf. Another vital area the conference addresses is education. 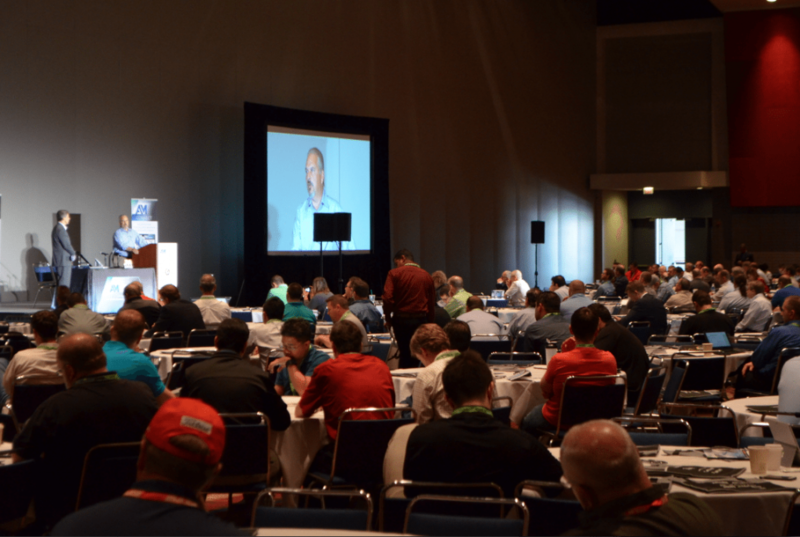 Hosting events such as the Student Summit, IMTS aims involve the next generation with technology. 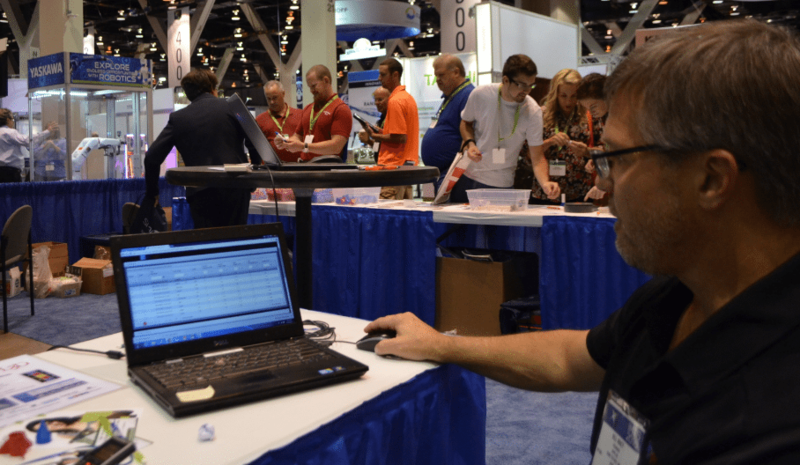 Activities such as Autodesk’s rocket design challenge and opportunities to use Zeiss and Lincoln Electric equipment were abundant. 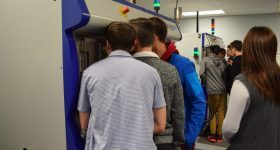 Rippl3D hosted one of the most popular student activities where students could use 3D printing to refine a rocket design and then test the results. 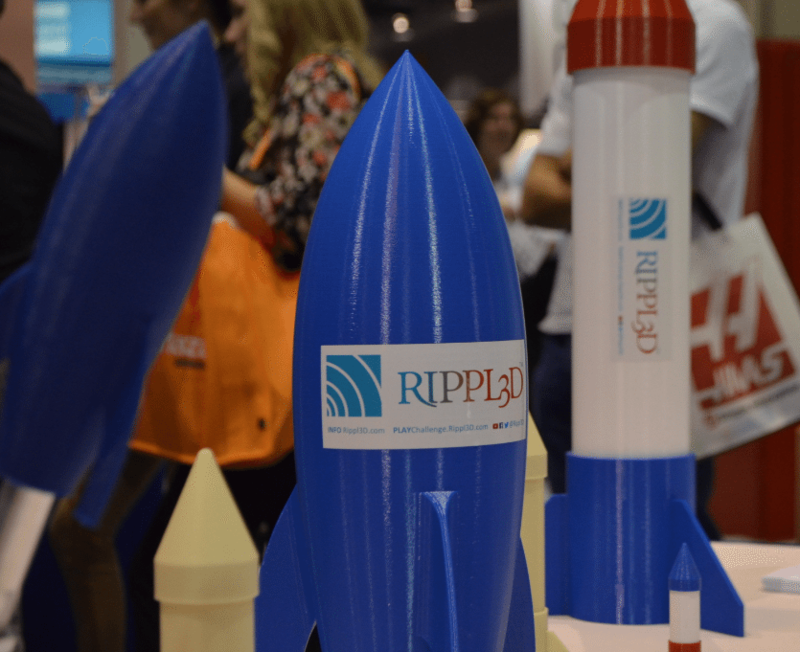 Over 2,400 people enjoyed taking part in the Rippl3D rocket challenge especially designed for IMTS 2016. 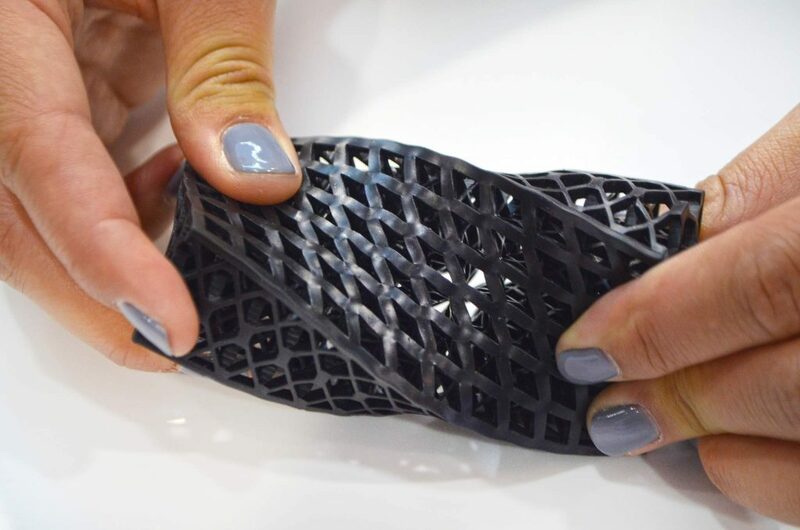 Bill Macy is the founder of Rippl3D and explains how his organization is breaking down the barriers to using 3D printing as a STEM tool in the classroom. “Students can assemble a rocket in 5 minutes and go test it and see how well it performs.” Our conversation is interrupted as one of the participants scores a perfect hit with his rocket. “Dude a bullseye!,” shouts an excited Macy, obviously as enthusiastic about technology as the students. “Look at his eyes, that tells the story right there,” he adds. 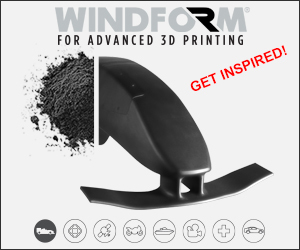 The Rippl3D website includes wind turbine projects and even an update to the science fair classic, a baking soda volcano. 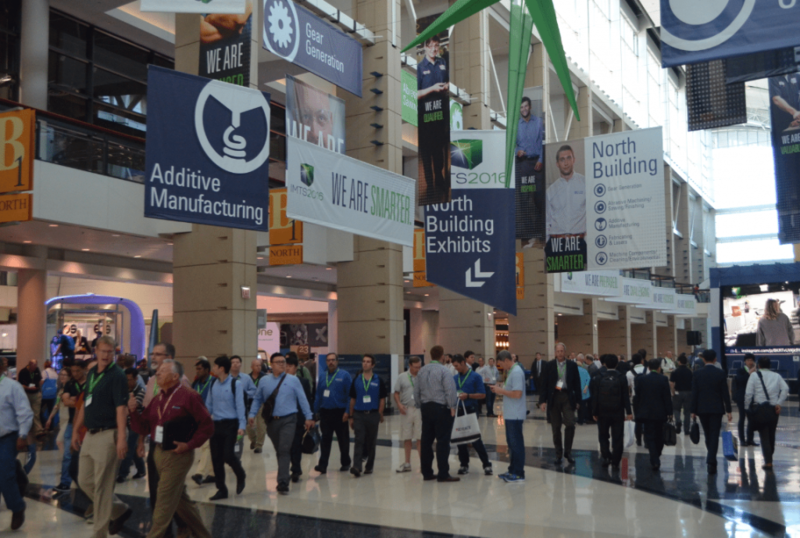 You begin to appreciate the scale of IMTS as soon as arrive in Chicago. During the ride from Midway to downtown Chicago, billboards advertising manufacturing company’s tower over the freeway, and the closer you get to McCormick Place the more branded polo shirts appear. 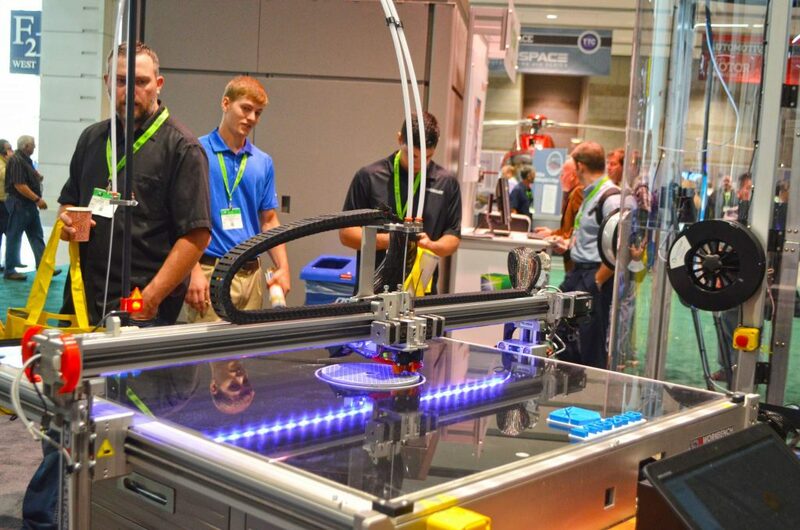 In my opinion the event ranks among one of the best for 3D printing for a number of reasons. 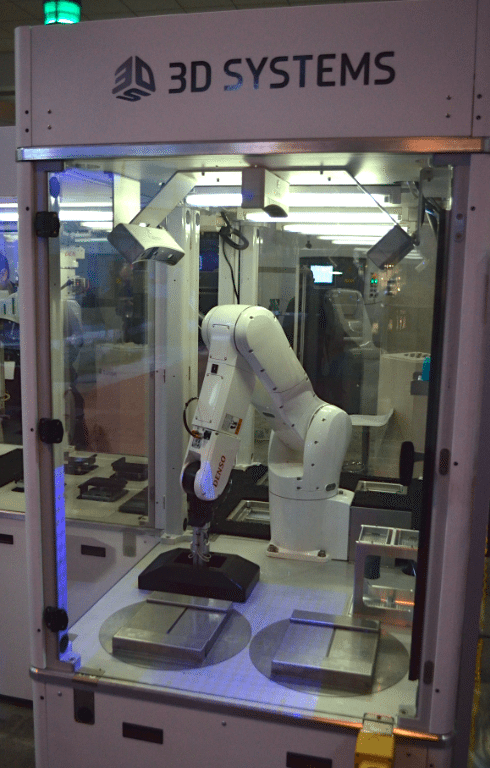 First, the technology can be seen alongside traditional manufacturing techniques and this demonstrates how the industry is maturing. 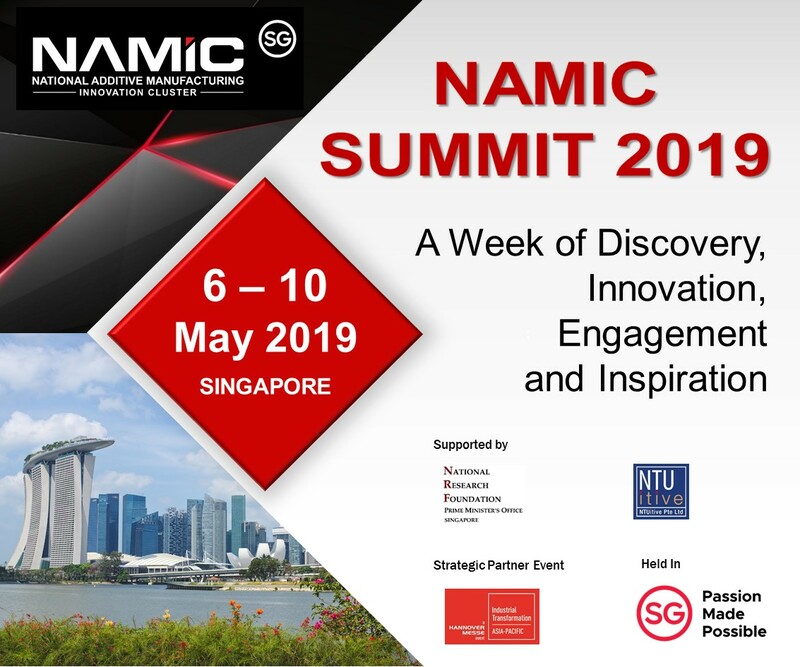 Secondly, but no less important, is the number of industry practitioners and experts who attend. This later aspect, and the range of networking events, provides plenty of opportunity for off the record conversations. 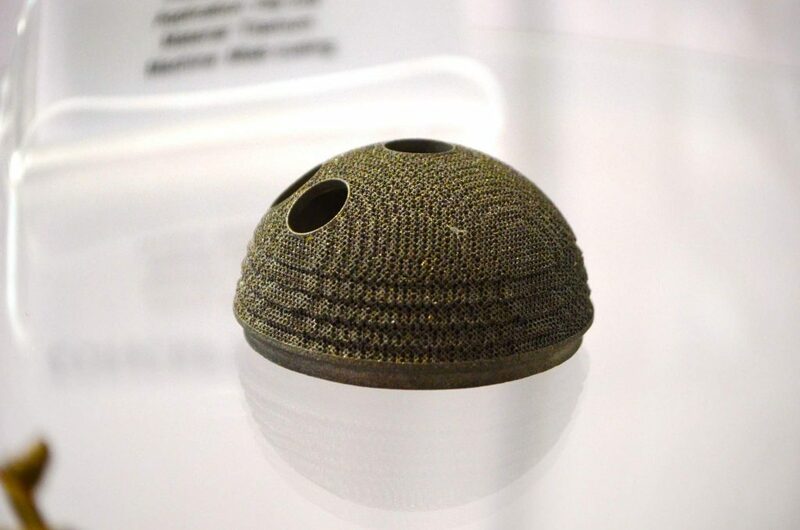 As 3D printing becomes a core technology in giving companies a competitive advantage, many 3D printer manufacturers find themselves subject to restrictive NDA’s that prevent public disclosure of the exciting ways their machines are been used. 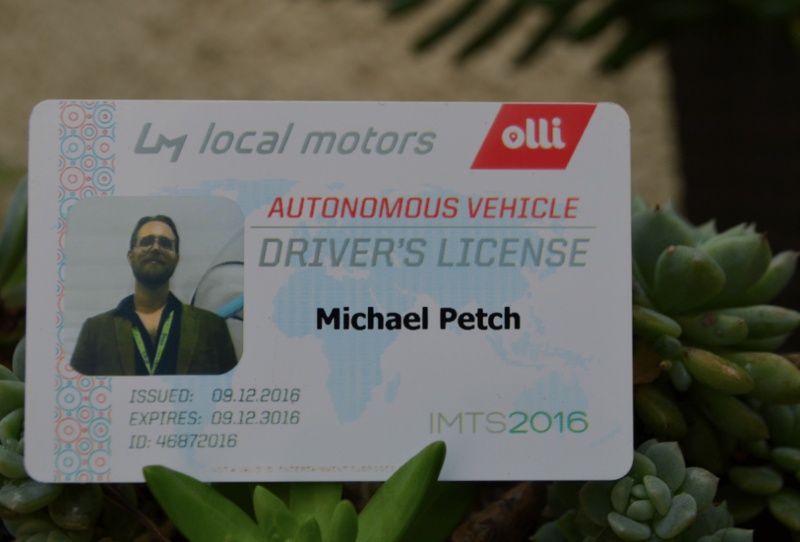 IMTS is an important forum to glimpse the future of 3D printing, and from what I saw and heard the next year is going to be an exciting one. 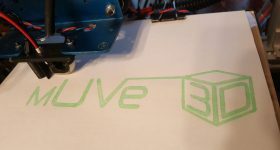 For coverage of future 3D printing events and the latest news, follow 3DPI on Twitter and Facebook or sign-up for our news digest here. All photos by the author, Michael Petch.